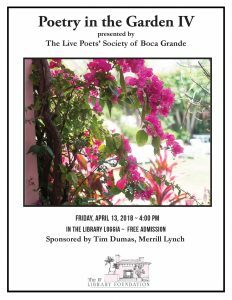 The Live Poets’ Society of Boca Grande will present the fourth “Poetry in the Garden” event on Friday, April 13 at 4 p.m. at the Johann Fust Community Library. The biennial events have been happening since 2012. The gathering is being organized by Alice Gorman and Lyndsay Major. Eleven artists will present their poetry at the event. Each will speak for three minutes. Some will choose to read their original work, and some will share their work along with a piece from a poet they admire. The Live Poets’ Society readers will include Simonetta Balzer, Alice Gorman, Candy Hooper, Julian Keevil, Lindsay Major, Les Nash, John Thomas and Nancy White. Three nonmembers will also be reading – Corky Ellis, Michael Haymans and Pam Miles. Adding to the event this year will be harpist De Luna. The Live Poets’ Society started as an informal group of writers who shared their poetry with others at the Caribbean Room of the Temptation Restaurant. The organization was founded by Barbara Mooney and Fred Berger. In 2009, the Live Poets’ Society of Boca Grande published a book of poetry called “Island Dreams.” The book was dedicated to Barbara Mooney. Johann Fust Foundation volunteers will provide complimentary wine and appetizers at the event. The refreshments will be organized by Carol Wythes. Susan Bowers will be providing the flowers. The free event is sponsored by Tim Dumas of Merrill Lynch.